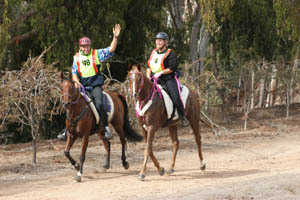 At 12:30 PM I climbed into the truck with Christy, and with 3 horses in the float, we left Castlebar Farm and headed off to the weekend Nowhere Creek endurance ride, an 80 km ride and a 40 km ‘training ride’ in Elmhurst, Victoria, put on by members of the Victorian Endurance Riders Association. I was prepared for a 7-8 hour drive across a small part of Australia, and with 2 stops for gas and 1 stop to pick up Subway, it took us about 7 hours. At Subway, I was CRAVING a salad, after a week of no greens, so I got a Big Salad, and asked the girl, “You have a shovel with that?” She gave me a fork, anyway. The drive to the ride was pretty much brown - brown trees, brown grass, brown fields with no grass; the rare green spots were from irrigation. Which may stop completely in the Murray River-Darling Basin - which includes most of Victoria and most of New South Wales, and a part of Queensland - unless there’s heavy rain in the next 6 weeks. The Murray-Darling Basin has 50,000 farmers and provides nearly 40% of Australia’s agriculture, 96% of Australia’s cotton, 80% of the grapes, 30% of the national cow herd, 45% of the sheep flock. Think of everything that will affect - fruits, vegetables, grain, hay, meat, dairy, wine, towns, etc - if there’s no rain. Everybody’s praying for rain. We arrived at basecamp in the dark, 7:30. 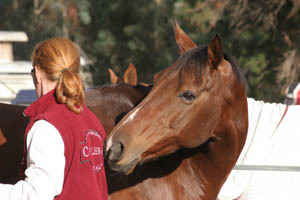 Chelsea, having come to ride one of the horses, was already there, having driven from the far side of Melbourne; Linda, who’d be riding another, and her husband Chris hadn’t arrived yet. We picked a spot under the trees, along the path outside a fenced-off round grassy field. 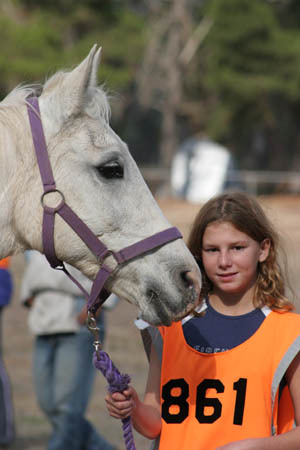 We quickly set up the aluminum pens and unloaded the horses, set them up with hay and water. They were rug-less so we had rugs to put on them… let’s watch Merri try to put one of those rugs-with-the-neck-warmers-attached on in the dark with no torch, with new puzzle-piece snaps to boot! I think by the time I got the rug on my one horse, Christy had parked the truck and trailer and unhitched and had dinner and a shower and gone to bed. And set up my Mondo Tent, into which I hauled my Swag, which is a thick cushiony sleeping pad encased in a canvas bag, into which you also put all your bedding and pillow. I crawled into my swag and curled up in it. My first night in a swag was very warm and comfortable… but I didn’t get much good sleep. Mainly because somebody kept banging buckets around, flinging them here and there, bang bang, throwing them down, bang bang, on and on - enough already! In my sleep-haze, I finally figured out it was probably a horse making the racket, and later on, as the banging finally stopped, then picked up again, I figured it was probably one of OUR horses, but I couldn’t be bothered to get up and do something about it. Instead I reached over and pulled out a pair of earplugs that somewhat tuned it out. When I finally started getting to the real sleep, it started to rain - rain!? For that I jumped up out of bed, because both my doors were wide open and my head and feet were getting sprinkled on. For good measure I moved my suitcase from the open to under a tree, and zipped up my tent doors, and crawled back in bed. The rain only lasted about 10 minutes, just a tease to the dry earth. Just about to hit the snooze hard, I heard a bird go off, and within two minutes, tens of thousands of birds were going off not far away, and they were LOUD birds, piercing my earplugs. Once I was up later, I hiked over to the golf course, where the main cacophony was transpiring, and discovered billions of white parrots, in trees, hanging from trees, between trees, in the sky, on the ground - everywhere. Not quite big enough to be cockatoos, but corellas, I think they were. DESTRUCTIVE PESTS! Many Aussies say, but I disagree, they are impressive, vocally and visually! (Of course, they aren’t eating my grain or hay, or crapping all over my property or truck). Me and birds, what can I say. The 80 km ride started at 11 AM and the 40 km at 11:30. Vetting started around 9 AM. Trot outs, instead of being out and back, were in a circle, and this continued throughout the ride. Good idea! They take horses’ temperatures here too, something I had heard of but hadn’t seen before. Christy also uses the thermometer at vet checks to help determine if the horse needs cooling down with water or covering with a rug. Entry fees were $75 for the 80 km and $45 for the 40 km. Other rides I noted in the Victorian Endurance Riding Association mini-magazine were: $80 for a 120 km, and $120 for a 160 km ride; these seemed to be about average. There were 22 entries in the 40 km, and I don’t know the number, but probably about double that for the 80 km. The sky stayed cloudy and cool and threatened rain throughout the morning, though nothing came of it. The atmosphere at the ride, as well as the start of both of the rides, was quite casual. No controlled start, and no herd ripping out of camp to set a torrid pace. 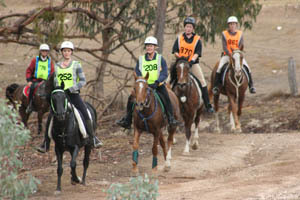 Several riders lagged well behind the official start time to get their horses to relax and move out calmly. The 80 km had two loops of 40 km (loop 2 was loop 1 repeated), with a hold of 1 hour, vetting at the half hour of your hold. The vets will actually call your number at the appointed half-hour time, so you’d better be there waiting; you‘ll get a minute or two grace, but after that you may be disqualified. The horses riding as novices had to complete the ride no faster than 6 hours, and no slower than 8 hours (so, no faster than 3 hours on each loop, no slower than 4 hours). 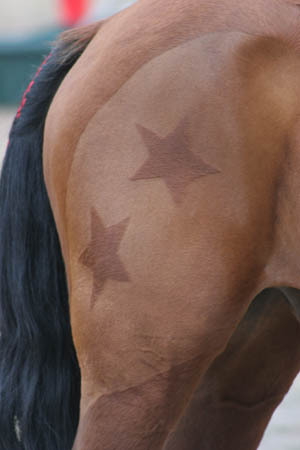 The qualified horses can go as fast as they want. I talked with Linda’s husband Chris about FEI rides - I guessed that at least 80-85% of American riders don’t care about FEI. He guessed the same goes for Australia. Chris came along to crew for his wife and Castlebar; he said with only 3 horses, he wouldn’t know what to do with himself! He’s used to strapping for 10+ horses at one ride. After the first loop, Linda’s horse vetted out lame; Christy and Chelsea finished the 2nd loop at 6:20 PM just at dark, and passed their final vet check in the dark. We ate a 4-course meal cooked by a club, and forgive me, I forget their name, but it was the best dinner I’ve had in a long time! (Not counting that shoveled salad the night before). They also had coffee and hot water available in the mornings, and they made lunch, and breakfast Sunday morning. And there were showers available! Later in the evening during final vet checks, a stallion broke out of his pen and got loose, running around the field among the horses getting their vet checks creating havoc, knocking his human over in his determination to have his way with a good-looking mare. Fortunately he was caught before anybody was seriously hurt. 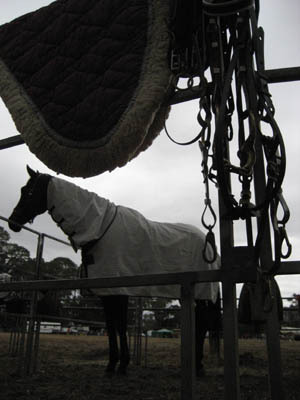 Everybody I saw in New Zealand at Horse of the Year (if they didn’t put their horses in these tiny, scary, assigned pens) and Nationals, and at this ride in Australia, uses the aluminum pens or the electric fencing tape, whereas in the States (in the West and Pacific South, anyway) we mostly tie to trailers or to high ties or Sky Hooks. Of course, a horse will get loose no matter what, and a horse will hurt himself no matter what, but I prefer the Sky Hooks. The horse can move around a lot and still lay down. I can just visualize too many scary accidents with horse legs through the aluminum fence pieces and the electric fencing containing only the horse that wants to be contained. 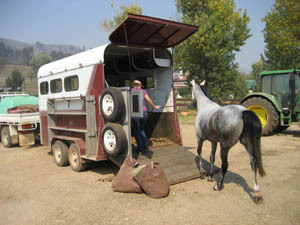 A friend from Nevada double-ties her stallion, the halter attached to the Sky Hook, then the lead rope from his halter tied to the trailer. I had a good sleep in my swag, popping earplugs in immediately. Which was why I missed The Great Stallion Escape again. I think it was the same stallion, this time loose without a halter, and apparently half the camp woke up (I was in the half that didn’t) and was chasing him around. I finally woke up to lots of yelling voices, one calling for a vet, but they were on the other side of the field. Our horses were still in their pens and Christy was gone; I figured I’d be of no use, stumbling around with earplugs in the dark looking for a dark horse, so I went back to sleep. BC judging was around 8:30 in the morning; here they judge BC for juniors, lightweights, middleweights, and heavyweights. And here they rode their horses only, didn’t show them in hand. Chelsea rode Oslo for the lightweight division, and he looked like he could easily do another 80 km. We went back and cleaned up our camp, packed everything away, loaded the horses and quickly took down the pens before going back for the awards. A fair number of people were still there as the head vet called out the names of the finishers and returned their horse log books with a completion sash and wine glasses (and bottles of wine for the BC winners). Then we were off - Christy back to Castlebar with the 3 horses, Linda and Chris to their home, and I got a ride to Melbourne with Chelsea. She was kind enough to drop me off at the door of my hotel in downtown Melbourne, which I greatly appreciated, because somebody keeps putting ROCKS IN MY SUITCASE!! It’s ridiculously heavy. 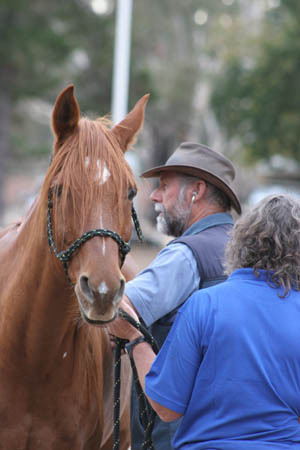 I’m headed for another leader of Australian endurance, Peter and Penny Toft in Queensland up north, and the Imbil ride May 5th. Stay tuned!